As a role player and a table-top wargamer, I’m not supposed to like Games Workshop, I’m supposed to be derisory and dismissive of their output and product. It’s the first law of gaming. However, I’m going to shock the world by stating that I rather like their miniatures and their games. In fact, if pushed, I’d have to say that WH40K is my favourite miniatures wargame. It’s got a great system that facilitates fast play while allowing for a certain amount of detail and variety. What really makes WH40K though, is the game universe in which it is set. Way back in 1987 GW released the game as an sf equivalent of their fantasy wargame Warhammer Fantasy Battles. What designer Rick Priestley did was essentially a pretty straightforward task: transposing the fantasy world of Warhammer into space and dressing up the classic fantasy races – Elves; Dwarves; Goblins; Orcs; Undead, etc. – into aliens. The masterstroke Priestley pulled, however, was not merely to relocate the fantasy creatures and characters into space, but to also transfer the original game’s medieval sensibility and aesthetics into this new setting. 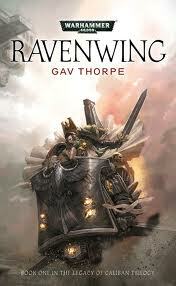 Although WH40K is set in the distant future, this future is riddled with fear of the unknown, witchcraft and heretics. It is a particularly bleak future in which gun toting armoured knights and nuns blast away at demons, monsters and sorcerous aliens. WH40K also had the good sense to retain the humour that distinguished WHFB and its RPG counterpart from other games. 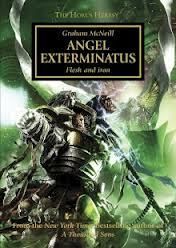 The universe of WH40K is grim and brutal, but it is a game that also features a great deal of humour, and this humour ranges from the macabre to the subtly witty. The biggest drawback to WH40K has always been its cost. I seldom use the words ‘cheap’ and ‘Games Workshop’ in the same sentence, but to give the company its due, it does give great value for money. All of its products, irrespective of what you may think of them stylistically, are of the highest material standard. GW miniatures, books, paint, brushes, whatever, pretty much outclass those of any of their rivals if assessed on material quality alone. However, that quality comes at a price, and the player new to the game has previously had to lash out a mighty sum just to get started. 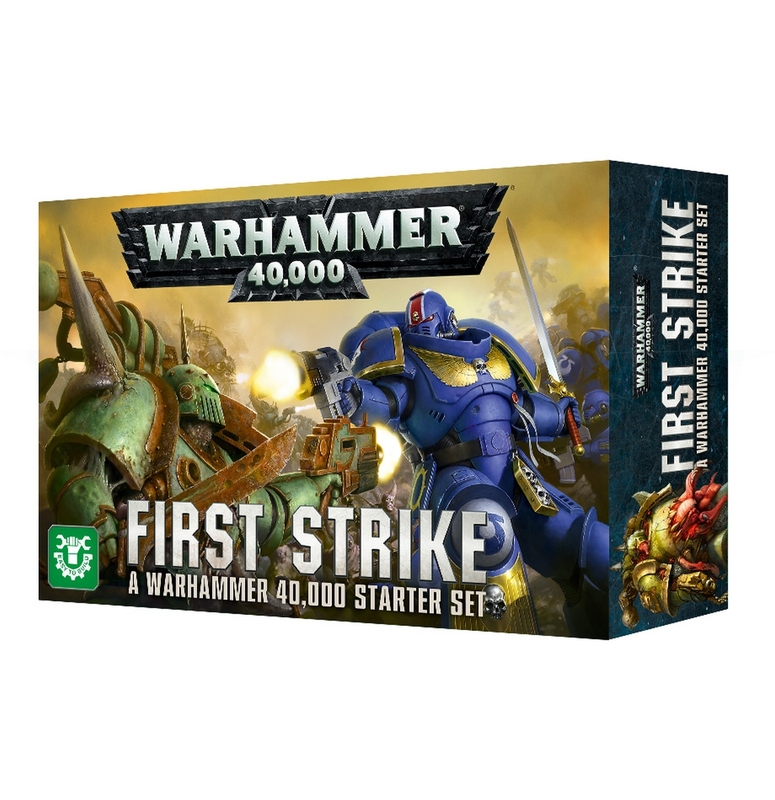 In 2017, when Workshop launched its 8th edition of WH40K, the starter set – Dark Imperium – clobbered you for 95 quid. True, you got a lot of stuff for your 95 quid: the hardback full rules, 53 rather splendid miniatures and a bunch of other booklets and gaming faff, but all the same the cost of just starting in the hobby must have excluded many. Indeed, for some time GW seem to have been reluctant to offer a more affordable entry level WH40K package. However, marketing strategy at the company appears to have changed: whether this is because they’ve decided that they’ll recruit more players if more players can get started in the hobby at a more affordable price; or whether the fact that other companies such as Osprey are now offering cheaper entry points into f/sf gaming; or some other reason, I cannot say. But, things have changed. First of all, GW have made the basic rules available for free as a PDF download from their website. Secondly, they now offer a series of entry sets that are stepped in pricing. Dark Imperium still wallops you for 95 quid, for those of us that have that 95 quid. In addition to this they now also offer – for 50 of your gaming pounds – Know No Fear, which includes 31 minis, a basic rules booklet and general bits of faff. But they have also now released First Strike for 25 quid. It’s this cheaper option that I wish to focus on. First Strike at an initial glance appears to be a little dinky box measuring roughly 9”X6”X2”, but it is full of stuff. You get 15 minis: 6 Space Marines and 9 Chaos baddies, and two booklets. The booklets are a general intro to painting, the WH40K universe and the rules and a condensed version of the rulebook. There’s also dice, a ruler, a printed paper 22” X 22” battle mat, and cards printed with the stats for the forces included. 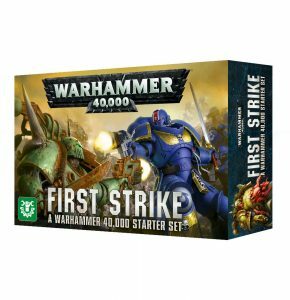 First Strike is a really good buy for the WH40K newbie, one nice feature is the intro booklet has a series of short scenarios that introduce the player slowly to each phase of the game. I also rather like the condensed rule booklet, quite nice to have and take to gaming sessions rather than lug the hardback book around. Another nice element – in fact something that GW seem to be doing with all their boxed sets at the moment – is the box’s inner tray is printed so that it can be used as a piece of gaming scenery. Gaming with this intro set not only convinced me that this is very good value indeed, but it made me realise – just by having me play with a total of 15 minis – that WH40K makes a perfectly good small-scale wargame and that we don’t always have to play with vast legions. My only gripe with this set – and it is a very minor gripe – is that you only get transfers to make your Space Marines as Ultra Marines, so if you want to add the guys in this set to an already existing army from another chapter you’re going to have to rummage around in your bits box for old decal sheets. Crucially, the availability of this cheaper set will see more players able to join the WH40K hobby, which is something I can only approve of.